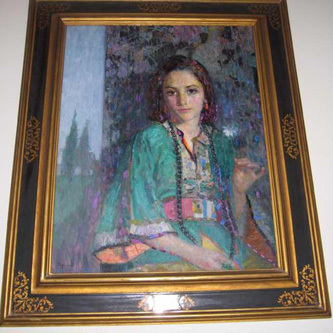 This portrait of an Armenian girl was given to President Wilson as testimonial gratitude from Armenia and Syria. Titled “L’Esperance” it was painted by Hovsep Pushman. It was given to Wilson by Mrs. Hovsep Pushman, the wife of the artist, in recognition of the help the United States gave to Armenia. The girl in the painting was the artist’s niece. The flower the girl is holding is called “Antaram” meaning everlasting, which represents hope. It currently hangs in the Woodrow Wilson House.